Jewellery is the envy of many a people. We have always admired a good design, ever wondered who comes out with such designs. 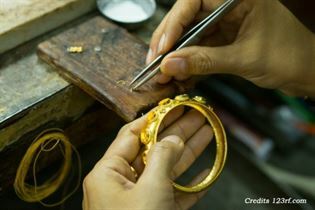 The art of making jewellery is one that requires training, creativity and most of all an eye for detail. Jewellery holds a very special significance especially in India since the beginning of civilization. The art of jewellery making can be quite a daunting one. The designer is required to design, mold the jewellery, identify and test the gemstones involved. The jewellery designer is also expected to manufacture and market his/ her designs. One can either be a part of the industry as a designer or join the manufacturing section. You will also have an option to specialize in Gemology which will deal with identification and grading of precious diamonds and stones. The designer has to prepare sketches on paper by hand on computer to conceptualize the design he has in his mind. This conceptualization is based on his feedback from the customer or the manufacturing team. The designs will include detailed drawings, a structural model, computer stimulations or a full-scale prototype. Once the design has been formulated the designs are created out of the regular or floral patterns and then forms are generated by connecting different structures together. Nowadays, computer-aided design (CAD) software's are used by jewellery manufacturing firms in order to facilitate product design and to avoid flaws during the designing process. CAD not only allows the designer to create a virtual-reality model of a piece of jewellery but he/ she can also modify, change the stone or try a different setting and see the changes on a computer screen before cutting a stone or performing other costly steps. Once the preliminary changes and settings have been made a mold of the prepared model is produced in a wax like or other material with the help of computer aided manufacturing (CAM) process. CAM helps in the easier manufacturing of numerous pieces of the same design. Once you have completed your course for jewellery designing, there will be ample of opportunities in both the private and public sectors both. There are government departments such as Museums, Antique Houses, Mines and many more. The government also runs test through UPSC, SSC, PSC, etc. As a fresher, a jewellery designer can start their career in any of the industries with a monthly remuneration of about Rs. 10,000 or above. Remember that the whole remuneration process will depend on how good you are at your work and the details of it. After two to three years, one may earn up to Rs. 30,000 or more. The firms in foreign countries pay the candidates with much higher salary. In that place even a fresher can earn a salary of Rs. 50,000 per month.